The TVS-1271U-RP has to be looked at, first and foremost, as a storage appliance with lots to commend it in this role, not least masses of storage space at a competitive price. As a server, however, it faces stiff competition from products better equipped to handle such demands. Once all about sharing data, Network Attached Storage (NAS) appliances have slowly grown in capability and come to resemble general purpose servers, particularly those at the higher end of the scale. 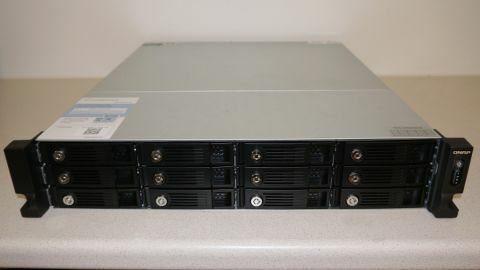 The 12-bay QNAP TVS-1271U-RP we are reviewing here is part of a wider family of appliances for desktop as well as machine room deployment but, in this case, very much destined for rack mounting and equipped to do a lot more than just share data. Appearances can often be deceptive but the TVS-1271U-RP certainly looks more like a server than a simple storage appliance, housed in a 2U metal chassis with hot-swap redundant power supplies at the back (hence the "RP" in the model number). Each power supply has a fan built-in but the main cooling is handled by a bank of much noisier fans buried deep inside the chassis which you have to power down in order to swap. The front panel is dominated by the storage, with 12 hot-swap drive bays to play with, able to accommodate both 3.5-inch and 2.5-inch disks using the slide in and lockable carriers provided. A screwdriver is needed to fix the drives in place and capacity is down to the disks employed. We tested using 4TB WD Red disks designed specifically for NAS use, giving a raw capacity of 48TB when fully populated, but you could use the latest 8TB drives and double that. Moreover, up to eight expansion units can be cabled to the appliance, each holding a further 16 disks, to deliver Petabyte levels of storage for those that need it. It's also worth noting that SSDs can be used instead of magnetic disks with the option of fitting SSDs in the first four drive bays and using these as a cache to boost conventional disk throughput, albeit only when reading data. Alternatively, and to save on valuable drive bays, it's possible to fit a pair of mSATA storage modules inside the unit and configure these to provide the cache. Naturally you also need plenty of network bandwidth to access all this storage with four Gigabit Ethernet ports as standard which can be aggregated by the QNAP firmware or assigned to logical VLANs. Additional bandwidth can then be added in the form of industry standard PCI adapters with two PCI slots available to take 10GbE adapters from either Intel or Emulex.